Quinoa … the “wonder grain” and other stories. 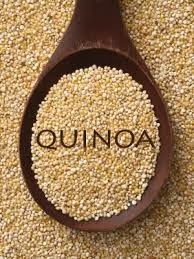 The supermarkets, newspapers and magazines these days are obsessed with preaching the benefits of Quinoa, ihe Inca grain that has made the Andes farmers super rich. I know I sound like I have something against this 800 year old grain or the farmers from Peru and Bolivia but its not so. What is "so” is the fact that in today’s world of trends, internet and food fads. we somehow forget the torchbearers. In this case I am talking about “Amaranth“, the 7000 years old seed (not grain) which was a staple of the Aztecs. We have all tasted amaranth greens as “chulai” in our saag or amaranth seeds in “Ramdaane ke Laddoo” . (a typical jaggery and popped amaranth seed candy). 1. Boil the amaranth seeds with double the water and whole spices for 25 minutes, till it absorbs the water. 2. Drain the excess water. Blend the amaranth mixture to a paste. 3. Add the garam masala and then the roasted chana besan to bind the mixture. Make patties. 4. Coat with popped amaranth seeds or bread crumbs. Shallow fry in ghee and serve hot.